For the third year, The Philadelphia Youth Orchestra (PYO) conducted a nationwide search to name the three winners in the PYO Young Composers Competition. All participants submitted original orchestral scores. The winners were selected by PYO’s music director, Maestro Louis Scaglione, and the director of the Young Composers Competition, Sheridan Seyfried, who is a Philadelphia-based composer, a PYO alumnus and a graduate of The Curtis Institute of Music where he studied with Richard Danielpour, Jennifer Higdon and Ned Rorem. Maestro Louis Scaglione is pleased to announce that this year’s Grand Prize winner is Daniel Zarb-Cousin, a classical composer and musician living and attending conservatory in San Francisco. His piece is titled “Symphonic Prelude in E Major.” Grateful for the opportunity, he said, “"Much of my piece was originally written as a sonata for cello and piano - however, it's scope was ultimately too large for that medium and I was inspirited to give over my themes to the full symphony orchestra. What followed was many months of taxing and arduous work, of chiseling out what I knew the material had the potential to be. The epiphanies and great truths it seems to realize were done so with me following steadfast behind! The work was finished on my birthday, May 22, of 2018." Zarb-Cousin will receive a cash prize of $2,000 and PYO will premiere his piece on June 2, 2019 at PYO’s 79th Annual Festival Concert in Verizon Hall at the Kimmel Center for the Performing Arts in Philadelphia. In addition, it will be professionally recorded for a future WRTI 90.1 broadcast. Scaglione recognized the second place and third place winners, as well. In second place is Jesse Edwards who attends Stephen F. Austin State University and his work has been performed by Lemberg Sinfonietta (Lviv, Ukraine), the Phoenix Ensemble (Ukraine) and the Hobart Wind Symphony (Tasmania). He will receive a cash prize of $1,000. The Third Place Winner is Evan Adams who attends New York University, where he studies composition. He will receive a $500 cash prize. He has produced, directed, and composed for projects that heavily incorporate intermedia elements such as dance, theatre, film, and music. Daniel Zarb-Cousin (1999-) is a classical composer and musician living and attending conservatory in San Francisco. He was born in Southern California but spent most of childhood in rural West Virginia, eventually returning to “So-Cal” to complete middle and high schooling. As a young red-robed choir boy in the secluded wood of pastoral Arthur I. Boreman Elementary, Tyler County, WV, Zarb-Cousin was initiated into the beloved Art to which he now devotes all things. By music, he seizes redemptive beauty and utter refreshment of the human spirit. He is a creator who respects standards of beauty and musical virtue, these being his foremost muses. His orchestral works “Largo for Orchestra” and “Fantasy for Orchestra” have each been premiered by the Orlando Philharmonic -- it was with these works that Zarb-Cousin enjoyed two consecutive victories in the widely acclaimed annual contest, the National Young Composers Challenge. Daniel Zarb-Cousin leads an extremely focused musical lifestyle. He is a steadfast devotee of composer Anton Bruckner and champions his music with fierce piety. He teaches piano and choir at various schools in the Bay Area and is the presiding Tenor Section Leader at St. Luke’s Episcopal Church in San Francisco. Zarb-Cousin’s aspirations are Symphonic, and he intends to leave the canon with a cycle of great symphonies. 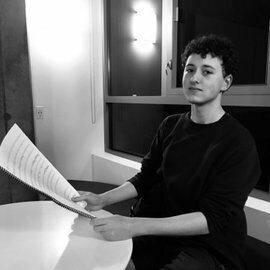 As to master his craft, he is studying with Nadia Boulanger-pupil David Conte at the San Francisco Conservatory of Music, where he will attain his Bachelor’s Degree. Jesse Edwards (born 1996) is an internationally performed composer of rising acclaim. His newest work, Mint Chic, was recently performed at the Alba International Music Festival, in Alba, Italy, by SOLI Chamber Ensemble. Edwards has worked with the Orchestra of the Pines, Starks Sound, and film director Adam Rothstein to create what has been noted as “accessible,” “wellspoken,” and “straightforward,” by the likes of conductor Gene Moon and Italian composer/educator Ferdinando Nazzaro. His music has been performed by the Lemberg Sinfonietta (Lviv, Ukraine), the Phoenix Ensemble (Ukraine), the Hobart Wind Symphony (Tasmania) and by high school and university choirs and bands throughout East Texas, where he currently resides. Jesse Edwards is a current student at Stephen F. Austin State University pursuing a Bachelor of Music in Composition under the instruction of Dr. Stephen Lias. He has received further instruction under Dr. Michael Daugherty, Dr. David Biedenbender, Dr. Lansing McLoskey, Dr. Maria Grenfell, Dr. Carl Schimmel, Mary Finsterer, Dr. Elliott McKinley, , Dr. Judy Bozone, Dr. Kyle Gullings, Peter Farmer, and Ferdinand Nazzaro. Additional workshops and masterclasses include training with Sean Callery, Ira Newbourn, Mark Snow, and Michael Levine. He has participated in the 2016 NYU/ASCAP Film Scoring Workshop and the 2017 Alba International Music Festival Composition Program. Evan O. Adams is a guitarist who composes relentlessly rhythmic and unashamedly poly-stylistic music reminiscent of a jukebox falling down the stairs, filled with absurdism and casual incorporation of pop and rock elements. With features in festivals such as Charlotte New Music Festival and performances from world-class artists such as loadbang and Beo String Quartet, his music finds a broken home in concert halls and dingy brewery warehouses alike. As the Artistic Director of new art collective Eclective, Evan has produced, directed, and composed for projects that heavily incorporate intermedia elements such as dance (Malleable Still), theatre (The Crucible), film (Malleable Still), and music (5 Lenses Recital). In the realm of dance, Evan has found success as a dance musician for modern technique classes at both the University of North Texas and Texas Woman’s University. Evan’s compositions for dance strive to break the mold of standard dance repertoire, and have been featured on several concerts, including UNT’s New Choreographers Concert and Faculty Dance Concert series. Studying under Joseph Klein, Claudia Howard Queen, and Andrew May, Evan attended the University of North Texas where he earned his B.M. in Music Composition in 2018. He currently attends New York University where he studies composition with Ezequiel Viñao.